The agonising wait is over. Club football is back. The likes of Boca Juniors, River Plate and Racing Club will be thrown straight in at the deep end this week as the Copa Libertadores resumes. The agonising wait is over. After almost three months of near-total inactivity punctuated only by Argentina’s short, unsuccessful tilt at the World Cup title, football is returning to our stadiums and streets. And there will be no room for a gentle reintroduction to the rigours of the competitive game: the likes of Boca Juniors, River Plate and Racing Club are thrown straight in at the deep end with the resumption of the Copa Libertadores. Not every team has had the same level of preparation for the last-16 ties, which kick off this Tuesday with the first legs. River have enjoyed the luxury of two Copa Argentina clashes against Salta’s Central Norte and Primera B Nacional outfit Villa Dálmine prior to their enticing derby tie against Racing, which begins in Avellaneda on Thursday. Both of those games ended in comprehensive victories for the Millonario but it nevertheless means that they go into the game with plenty of match practice behind them compared to their neighbours to the south. Racing’s own Copa Argentina adventure ended before the World Cup with a shock defeat at the hands of Sarmiento de Resistencia, and a sole friendly outing against Ferro last Wednesday behind closed doors marks the closest to a full 90 minutes Eduardo Coudet’s men have played since the Superliga wound up in May. There has been a fair bit of transfer activity around El Cilindro, too. Argentina-born Chile international Gabriel Arias has returned to his native country to replace goalkeeper Juan Musso, who was snapped up by Udinese in Italy; the same destination of striking hotshot Lautaro Martínez, signed by Milan giants Inter. To fill that gap in the attack Coudet swooped for cult Racing idol Gustavo Bou, the hero of 2014’s Primera División title. The likes of Jonathan Cristaldo and Chilean pair Eugenio Mena and Marcelo Díaz have also landed or are on their way to Avellaneda, while fellow new recruit Mauricio Martínez will not feature against River after suffering the misfortune of a torn cruciate ligament just days after his arrival. That flurry of comings and goings is in stark contrast to the sedate atmosphere around the Monumental. River are yet to enter the transfer market this winter, choosing instead to stick with the bulk of the squad that was galvanised in 2018 by Supercopa victory over Boca Juniors and goes into the last-16 tie as narrow favourites over their big five rival. 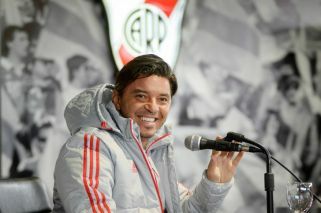 Perhaps even more important is the presence of coach Marcelo Gallardo for yet another season, despite strong reports linking him with the vacant Argentina job. With a settled first team and an enviable cup pedigree – Gallardo has won no less than eight titles during his four years on the bench – the Millonarios will be an extremely tough nut to crack both in Avellaneda and in August 29’s return leg. Racing and River are not the only Argentines returning to continental action this week. Bolstered by the likes of Mauro Zárate, Lucas Olaza and Esteban Andrada, reigning Superliga champions Boca Juniors restart their pursuit of their own personal ‘white whale’ on Wednesday. The Libertadores has become a near-obsession in recent years for the club and president Daniel Angelici, who famously told fans to “get their passports renewed” upon taking over in anticipation of an imminent Club World Cup date that is yet to materialise. Standing in their way are Paraguay’s Libertad, who will start as rank outsiders after firing coach Raúl Bobadilla amid a run of indifferent form and who could represent a relatively gentle reintroduction to the rigours of the Copa following this winter recess. Up in Argentina’s north west, meanwhile, Atlético Tucumán aim to continue making history. The Decano feature in a Libertadores knock-out stage for the first time in the club’s existence in 2018, and their reward is a blockbuster tie against 2016 winners Atlético Nacional which kicks off on Thursday in the city’s José Fierro stadium. Merely getting to this stage is achievement in itself for a team drilled watchfully by the hard-nosed Ricardo Zielinski on the bench and with diminutive playmaker and club icon Luis ‘Pulguita’ Rodríguez running things on the pitch, but they will be desperate to cause another upset and knock out one of the continent’s heavyweights. Four-time Libertadores champions Estudiantes are also in action, against none other than reigning holders Gremio, making for a veritable banquet of football for starved supporters after the hardships of the last few months.